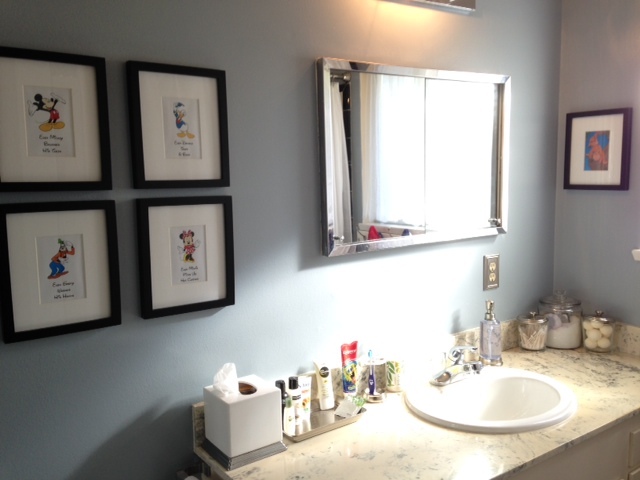 When we moved into our house last summer, we were granted a pretty big luxury-two whole bathrooms. TWO bathrooms! One off the master bathroom and one off the main hallway. We turned the hallway bathroom into our ‘guest’ bathroom, but since we rarely have overnight visitors and we always have our 2.5 year old, it actually became Little H’s bath pad. 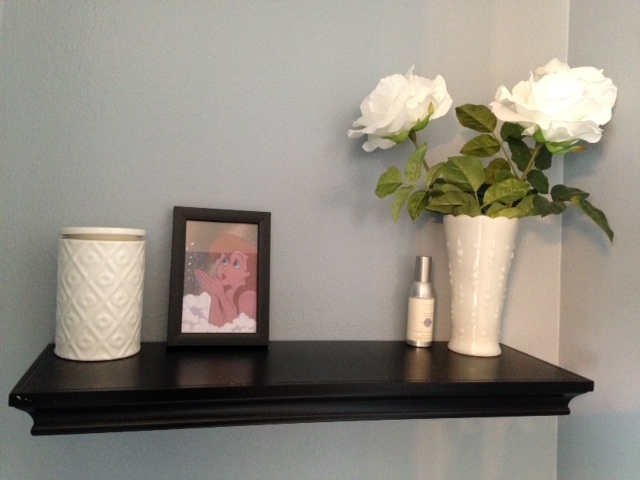 Our home is a rental, and every wall was originally painted a putty shade of off-white. Very depressing, and next to impossible to spruce up. 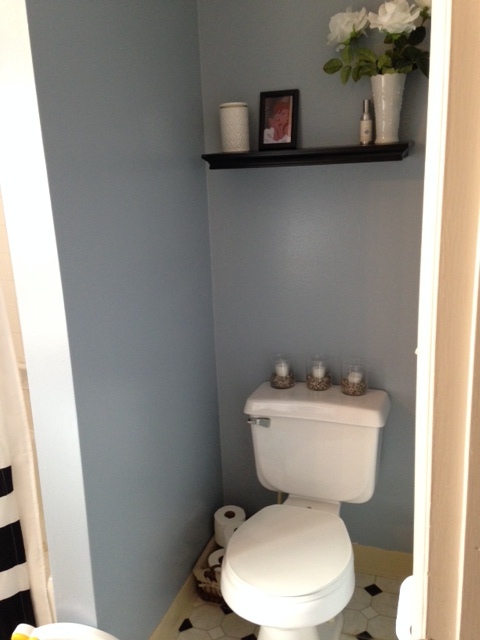 Luckily our landlord allowed us to paint, and I was able to put some color on the walls. You can check out the pins that inspired me here. I started with a color scheme that would work with the floor. 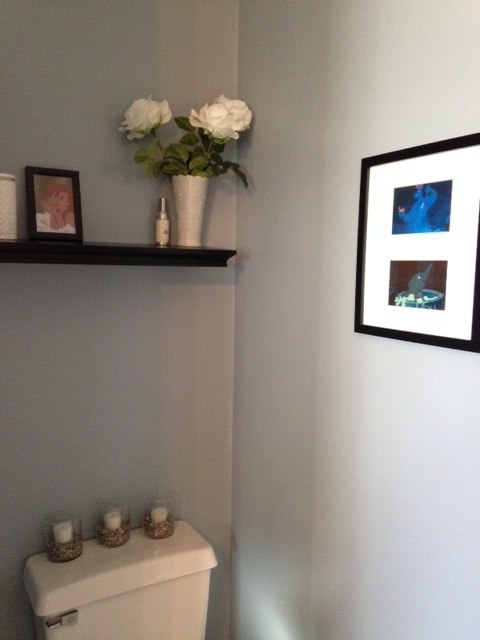 The black and white was actually great, but I wanted a bit of hue to it, so I chose a gray/blue for the walls. 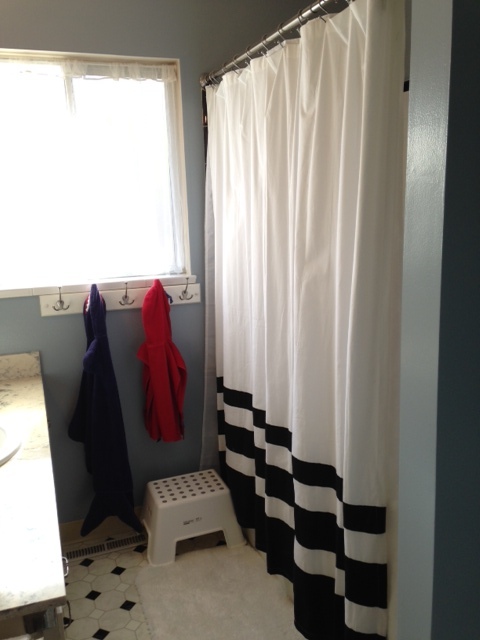 I had a black and white shower curtain that worked great and replaced the old metal towel bar with a set of hooks from Target. There was actually a glass sliding door on the shower when we moved in, but we thought that could be very dangerous for a 2 year old, so my husband and father in law removed it. It only took about 10 minutes and we can re-attach it with some putty when we move out if they want it back in! 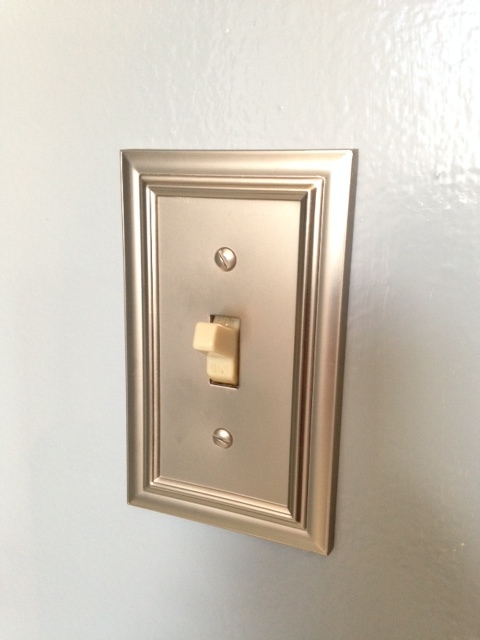 One of the things I do for every room I decorate, regardless of where we are renting, is switch out the light and electrical plug plates. 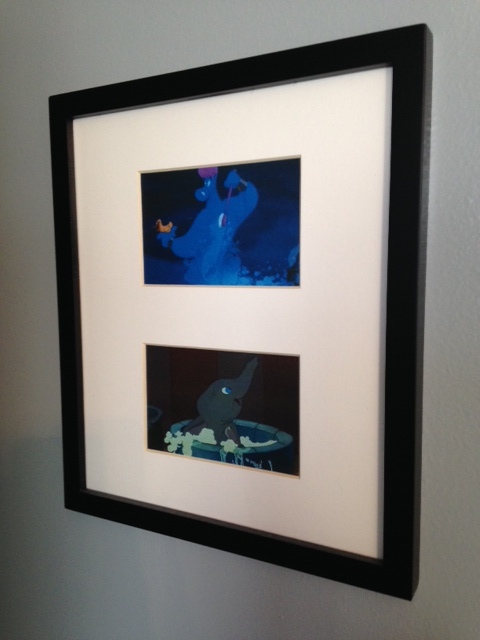 I try to pick ones that match the personality of the room, and they REALLY make a difference. It seems like the painters who paint our rentals before we get there try to get as much paint on the fixtures as possible, because the plates always have drips and streaks on them. Nice, clean plates really make a difference, and they are pretty cheap at just about $5 each! The goal of the counter top is always to try and get it as clean and empty as possible. 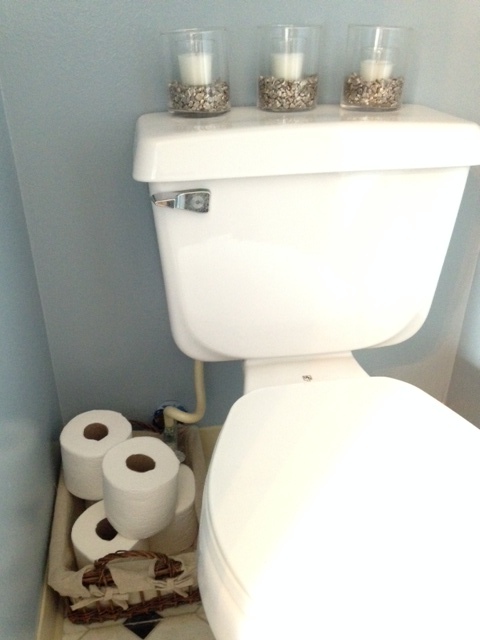 Because we don’t use this room very often, it was much easier than in our master bath. I have canisters with Epson salt and bath bombs in them, although I like the idea of storing nail polish and hotel shampoos/soaps in them as well. 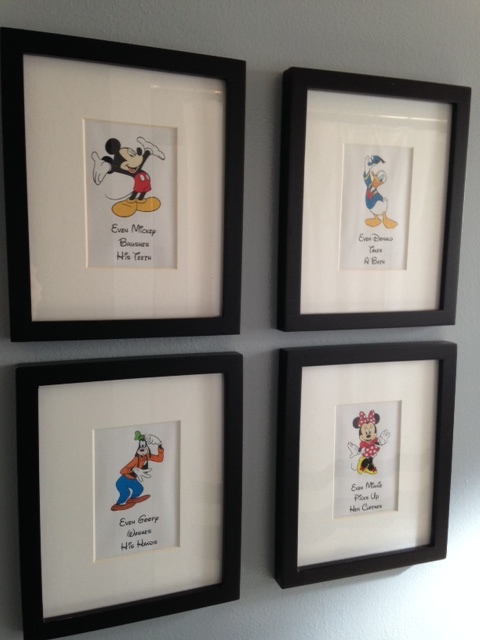 To make this room a bit more kid-friendly, I added these Disney prints. I saw the idea on Etsy using superheros, but we’re more of a Mickey house. You can download your own set of them for free here!